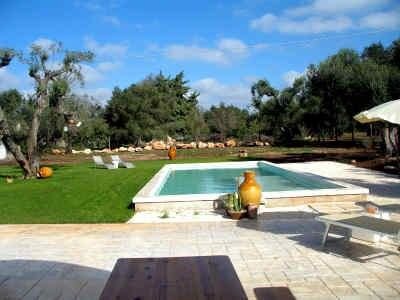 The owner of thischarming trullo is yogateacher and this is reflected in the tastefuland discreet furniture.The beautiful location on the large plot of 10,000 m², which also hosts a swimming pool (9x4m,open from 30.05. to 29.09. ), simply invites you to meditate one. Here youcan just let go well andenjoy the tranquility. The trullo has a very well equipped kitchen so you can cooking here very well. Furthermore the holiday house offers one double bedroom and one twin bedroom. For further 2 persons you can use the bedsettee. Cisternino, one of the most beautiful villages in Italy, offers typical small alleys, with many nice restaurants and bars. In the summer there are also many festivals, concerts and celebrations organised. Other places of interest like the baroque town Martina Franca, Alberobello (UNESCO World Heritage), Locortondo and Ostuni but also the beautiful coastline with sandy and rocky beaches and small bays are not far away. Payable on site: heating and wood according to consumption (about € 10,00-20.00/day), security deposit € 250,00.